MT. WILSON - Transport Dad to another world this weekend with the heavenly sounds of cellos, violins and even an accordion. The Mt. 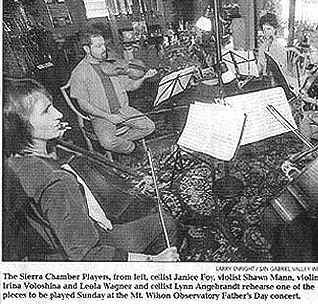 Wilson Institute will present the Sierra Chamber Players in a free Father's Day concert at Mt. Wilson on Sunday. "We thought it would be fun to have a concert with music that lends itself to an observatory theme or that is about the heavens," said Rebekah Gibson, director of development at the Mt. Wilson Institute in Pasadena. The afternoon of chamber music will feature Wolfgang Amadeus Mozart's popular "Eine Kleine Nachtmusik" and Sheldon Cohen's world-premiere arranged version of four of Gustav Holst's "The Planets" for string sextet and accordion. Composer and accordion virtuoso Nick Ariondo will contribute two works - "Gypsy Fantasy for Two Stars" a duo for accordion and cello and Tango Indo-Serene" for string sextet and accordion. As dusk approaches, the concert will conclude with Arnold Schoenberg's "Transfigured Night" for string sextet. The Sierra Chamber Players, founded in 1997 by cellist Janice Foy, have played at Pasadena Presbyterian Church, Arcadia Public Library and the Pasadena Library. They have also given a command performance for the European Union hosted by the British Consul General and they also played for the Ronald Reagan Library Music Series Father's Day concert. Participating performers are: Foy and Lynn Angebranndt, celli; Leola Wagner and Irina Voloshina, violins; Shawn Mann and Gina Dorman, violas and special guest star Ariondo. "This is truly unique programming," said Foy, a former cello instructor at Azusa Pacific University. "We're going beyond the usual string quartet and in a combination that makes you wonder if it will work. This concert will prove we can do anything." Ariondo, who has a Master's degree in composition and performance, enjoys bringing his misunderstood instrument to interesting venues. "The upper ranks are afraid to use the accordion in this area because they see it as only for folk music, and the media pigeonholes it," said Ariondo, who has won 13 consecutive awards from the American Society of Composers, Authors and Publishers. "There's a lot more depth to it - chamber, orchestral, symphonic." Foy, who has a Ph.D. in ethnomusicology, is trying to save chamber music from extinction and hopes this concert will help. "Funding for the arts is diminishing," she said. "We must keep chamber music alive or we'll be an uncultured pop society that doesn't know its roots. You normally buy Dad a fish dinner or a tie, but dads like celestial things too, so this is a chance to become highly cultured in different areas."